A Camp began as a collaboration between Nina Persson of The Cardigans and Nicolas Frisk of Atomic Swing, but soon snowballed and picked up several notable players, some in temporary and some in permanent roles. Their debut was released in 2001 and showcased the detailed, spooky production of Sparklehorse’s Mark Linkous. 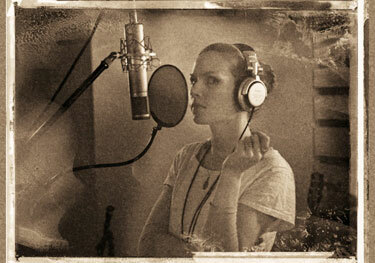 It wasn’t until 2007 that The Cardigans’ schedule allowed Persson the time to return to her new project and start composing a second album. With Persson and her husband (film composer) Nathan Larson producing the album themselves, Colonia has a markedly different tone than the folky ballads that filled the eponymous debut. Recorded in New York with the likes of James Iha and Nicolai Dunger making appearances, the album is diverse and glamorous, big and bright. What was the impetus for your trip to South Africa that ultimately inspired so many of the themes for the new album? Me and a Swedish girlfriend went to visit our Namibian friend, who now lives in Cape Town. We went with her family on a camping drive through South Africa and through Namibia, so most of the time we spent camping in the Namib desert, and this was really amazing to me. It was unclear after the release of the first A Camp album if it was a lovely one-off project, or the debut something long-term. And Colonia certainly suggests that there is a full-fledged band at work. Do you already have intentions to work on new A Camp material? Well, I guess we’d love to do more A Camp music, but at the moment it’s hard to think of what’s next… We’re on a long tour and loving that, and ideas of new music usually don’t come until work has cooled down a bit. With such a different sound between the two releases, was there ever doubt in whether to rename the project? What are the core ingredients, to you, that the two A Camp albums have in common? No, in my mind, anything that I do aside from the Cardigans will be called A Camp. It would be too hard and confusing to try to establish another project name at this point. The ingredients that will always be the same are me, and probably Nathan and Niclas, and I feel like we have found a world of music where we always find more when we grab for it. Was there a particular moment or idea or song that led you to decide to immerse yourself in A Camp a second time around, after a long spell of focusing on The Cardigans? Not really, the three of us had discussed making a second album for years, we just needed to free up time enough to do it. Where did you record Colonia? Do you do any of your recordings at home? We recorded it in a bunch of different studios in NYC, and a tiny bit in Tambourine Studios in Malmö, Sweden. We have a rehearsal space that is also Nathan’s studio for his film music; we did a little bit of recording there as well. By now, we have built a room in our house that’s gonna function as a studio, so in the future we’re hoping to do more at home. I really enjoy the blend of your voice with Nicolai Dunger’s in "Golden Teeth and Silver Medals." Had you ever sang with him before? No, this was the first time. But I have loved his voice for a long time, so I was so happy to finally get to propose to him…! You have spoken of being inspired by the Swedish melancholy — can you talk about how this affected you growing up, and how you address it in your music? Melancholy is not really the right word to describe the mentality. Swedes are more… serene and mellow, and not afraid of the dark, and this is something that I still think is a big part of my personality, even though I’ve learned some good stuff from living in the U.S…. I can’t really talk about how my Swedishness affected me growing up. It simply is what I am, and my music is probably really colored by it, I’m just not the person to see it. How long have you lived in New York, and how has it changed your musical sensibilities? I have lived there on and off for about ten years, and more permanently for the last three. I feel very liberated there. The multitude of everything has made me more free to do what my instincts tell me. In Sweden things are just more homogenous, which makes you a bit limited and your mind gets walled in a bit. I am curious about your experience acting in Om God Vill… Did you find that this came naturally after writing songs from the perspective of different characters, and shooting music videos? Well, I thought that I would be helped by these previous experiences, but I was still a bit shocked at how difficult I found acting. I loved it, but I really realized that it makes sense to get training as an actor. I can naturally act when I’m in the mood, but when you make a movie you simply have to be in the mood every day at four in the morning and whenever you’re told to be. What are three things that you love? What are three things that you hate? Can’t even think of one! Who are some artists you are currently enjoying? Frida Hyvönen and Nina Simone. Posted in Music Interviews and tagged A Camp, Anna-Lynne Williams, Music, Swedish. Bookmark the permalink. Trackbacks are closed, but you can post a comment.